The definitive, practical handbook on positive psychology and character strengths for practitioners working in coaching, psychology, education, and business – start using strengths today! This book is the epitome of positive psychology: it takes the “backbone” of positive psychology – character strengths – and builds a substantive bridge between the science and practice. Working with client’s (and our own) character strengths boosts well-being, fosters resilience, improves relationships, and creates strong, supportive cultures in our practices, classrooms, and organizations. This unique guide brings together the vast experience of the author with the science and the practice of positive psychology in such a way that both new and experienced practitioners will benefit. New practitioners will learn about the core concepts of character and signature strengths and how to fine-tune their approach and troubleshoot. Experienced practitioners will deepen their knowledge about advanced topics such as strengths overuse and collisions, hot button issues, morality, and integrating strengths with savoring, flow, and mindfulness. Hands-on practitioner tips throughout the book provide valuable hints on how to take a truly strengths-based approach. The 24 summary sheets spotlighting each of the universal character strengths are an indispensable resource for client sessions, succinctly summarizing the core features of and research on each strength. 70 evidence-based step-by-step activity handouts can be given to clients to help them develop character strengths awareness and use, increase resilience, set and meet goals, develop positive relationships, and find meaning and engagement in their daily lives. No matter what kind of practitioner you are, this one-of-a-kind field-guide is a goldmine in science-based applications. You’ll be able to immediately bring the science of well-being into action! Ryan Niemiec is Education Director of the VIA Institute on Character, a nonprofit organization in Cincinnati, Ohio. Check out Ryan's activities here. "A really valuable and welcome resource … An excellent contribution to the field. "The application of positive psychology and strengths is growing in organisations, education and in the clinical setting. The VIA Survey has been around for a number of years now and is one of the few academically sounds strengths diagnostics available at no charge. This book acts a “handbook” to understanding the theoretical model, the strengths themselves and contains descriptions of 70 research-based interventions – quite a lot of return for your investment in the book.It is extremely well written and, more importantly for me, strikes a perfect balance between academic rigor and practical guidance. It is very accessible, but still provides a robust explanation and discussion of the strengths approach. The suggested interventions provide a treasure trove of exercises to apply with yourself and with others if you have a role as a coach or development practitioner." "Honestly, I read the entire book and appreciated all that Niemiec offered. The book itself is well-written, offers in-depth information, direction, background, appendices, practitioner snapshots and oh so much more. I will continue to suggest it to colleagues who might be interested in the content because, in my experience, if you read the book, take the time to reflect on the material, do the snapshot activities, practice the protocols yourself before client use, there’s much to be gained." "Character strength interventions are about getting clients in touch with their strengths and finding ways to utilize those strengths to cultivate meaning and enrich their lives. 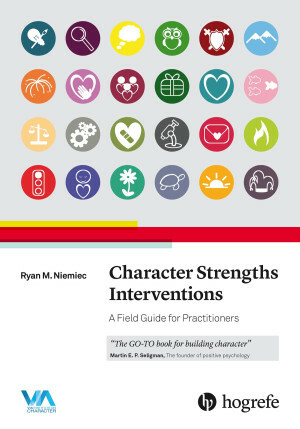 He educates the reader on the foundations of character strength interventions, relays evidence to support his claims about the usefulness of character strength interventions, and explains countless interventions step-by-step providing practitioners with a useful handbook. 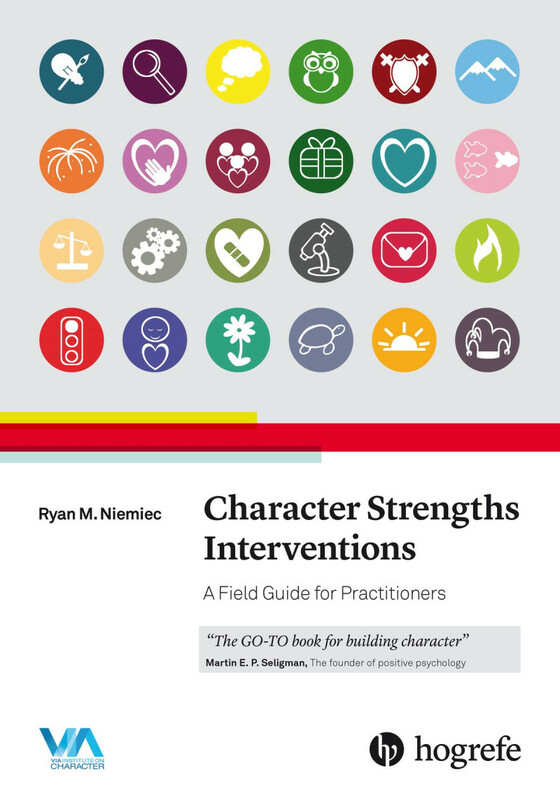 Character Strengths Interventions is a must read for clinicians who believe in using strengths-based interventions or who are interested in learning more about positive psychology in practice." "Character Strength Interventions gives readers a fantastic in-depth tour of the science of the 24 Values-In-Action (VIA) strengths. The guide contains many immediately applicable interventions that can be used with clients.For practitioners like me, the true gems of this book are the tips, snapshots, handouts, and interventions.The guide includes 24 very useful handouts, one for each of the VIA strengths. These contain a definition, research highlights, questions for strengths building, and interventions. These handouts are fantastic resources to help practitioners and their clients understand the essence of each strength, where to learn more about it, and ways to develop and use it. Even better than the handouts are the 70 strengths interventions that make up chapter 8. Most of these interventions come with an overview, the purpose of the intervention, the specific steps involved, and the research behind it. Many of these also come with tips and even troubleshooting ideas. Character Strengths Interventions is a gold mine for practitioners. Its tips, 24 handouts, and 70 interventions are the most valuable nuggets." Marshall Goldsmith, PhD, Thinkers 50 #1 Leadership Thinker in the World, and international bestselling author of What Got You Here Won’t Get You There and Triggers.